The Joule is a revolutionary new zero emissions electric vehicle from South African company Optimal Energy. With the Joule destined to be revealed at the 2010 Geneva Motor Show and bound to turn as many heads as it would minds, it was important that visitors have easy access to information that reflected as much of the vehicles impressive features and unique design as possible. Our key goal was to create two information points that would serve as an extension of the vehicle on display allowing visitors to explore the Joule’s many layers that would not normally be possible in such a confined space as well as to allow interested consumers or fanatics to sign up and receive future information and official launch details. The main feature we developed was the multi-facetted 3D exploration of the Joule. Not only did this component allow visitors to easily explore the Joule from all angles with the simple flick of a finger, but even let them strip away the many layers of the Joule, exploring everything from the chassis to the electrics and interior. Each view was complemented by info hotspots sharing details on where everything was placed and what it did. 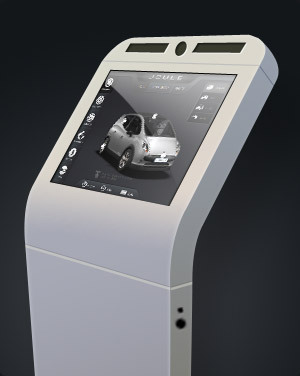 The kiosks also contained animated and interactive information on the Joule’s performance and low environmental impact as well as backgrounds of those behind its innovative features. Users were able to register quickly for future updates by only entering their name and email addresses. The kiosks proved to be a successful addition to the Joule display with visitors enjoying the explorative features normally not easily accessible to them in such spaces. 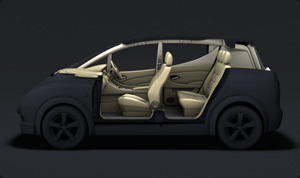 Many registered for future updates and notifications proving the Joule’s impressive new way of thinking were shared by many audiences of the 2010 Geneva Motor Show. One of the key features of the touch screen that visitors enjoyed was the on-screen display that gave a live indication of what the Joule’s battery life would be versus the kilometres they would have driven during the time they were using the units. The kiosks were clearly upstaged however by the Joule itself which is indeed an impressive piece of South African technology we look forward to seeing on our roads soon.